My family and I are moving tomorrow. Hard to believe it is finally here. 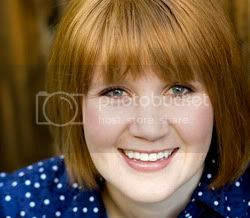 I have been so comfortable in Utah - I have lived here since I was 7, only taking a 3 year break for college (and the summers living with my parents in Hawaii). It is what's comfortable, it is where my family is, it is easy. But here we go! On to a new adventure! We are moving to Lincoln Nebraska while my husband attends UNL's law school. It is exciting and scary to be going to a place that is different, uncomfortable, new! I hope we adjust quickly. I am a little shy and am planning on the first 6 months or so being really hard. Like my mom says, if you plan on it being really bad then you won't be disappointed; you may be pleasantly surprised. So almost everything in our little apartment is boxed up. And of course, that includes my kitchen. We will be eating out for the next week or so - so be patient with me. I will be back soon with some new recipes - maybe even Nebraska-inspired recipes! For my first catering event (ha!) I made these panini and this salad. I was a big fan of this salad. It was delicious and refreshing. But I afterwards I thought how delicious this would be in all seasons - especially with the fall apple harvest. 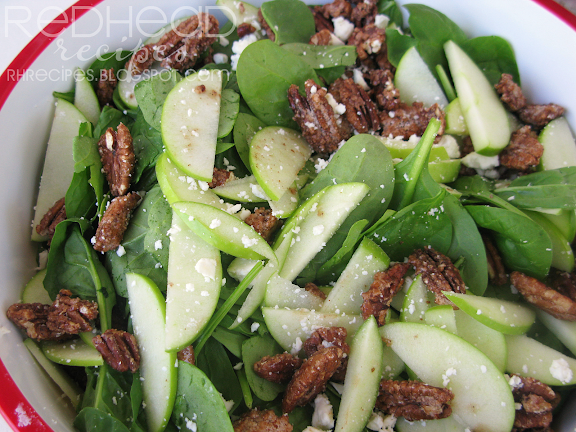 This salad is really simple - make the nuts ahead and it will only take you a few minutes to do. The nuts are my favorite part, but don't get scared when you see the secret ingredient, you can barely notice it's there. Combine sugar, cayenne, cinnamon, and nutmeg thouroughly. Place in skillet over medium heat. When sugar starts to melt stir in nuts. Stir occasionally. Once all sugar has melted and nuts are coated, place nuts on parchment paper to cool. Eat plain, in a salad, or on top of ice cream. Place all ingredients in a curet and shake. Congrats to Robyn who said, "Have been waiting to try this place!" Please email me within 48 hours with your mailing address and I will ship this free meal to you. Congrats! My husband has told his fellow co-workers about this blog and frequently talks about my cooking. After all that talking and bringing leftovers, they said I needed to feed them lunch. I fed his department - about 14 people. Not a huge undertaking. 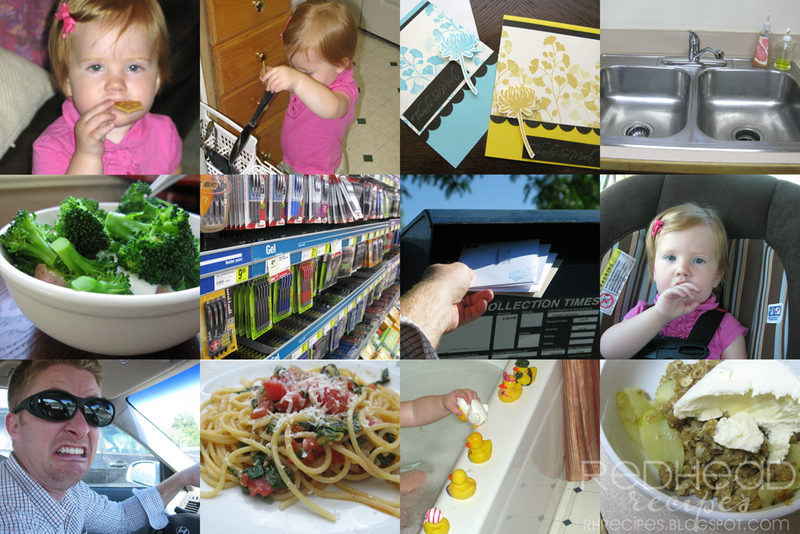 But seeing how we are moving this week, I didn't want to buy a lot of things or do a lot of cooking. (We are packing up the kitchen!) So I put together a simple lunch of panini and salad. These panini are so simple but were a big hit. I guess you could say I had my first catering event! This is a great recipe because it is so simple to make for a few or multiple people. Because I made it simple I used a roatisserie chicken and prepared pesto. If you wanted to be really gourmet you could do these yourself, but I don't think you can really tell the difference. One of the women at his work is vegetarian, so she had one without meat - it was still delicious. 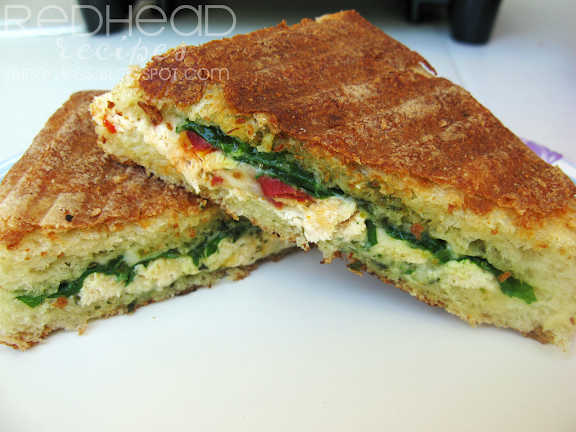 Prehead a panini press. To build the panini: Spread one tablespoon of the pesto on each piece of ciabatta bread (I like it split between both sides). Sprinkle shredded mozzarella on each side of the bread. Then layer a few spinach leaves, a few sun-dried tomato slices, and the chicken. 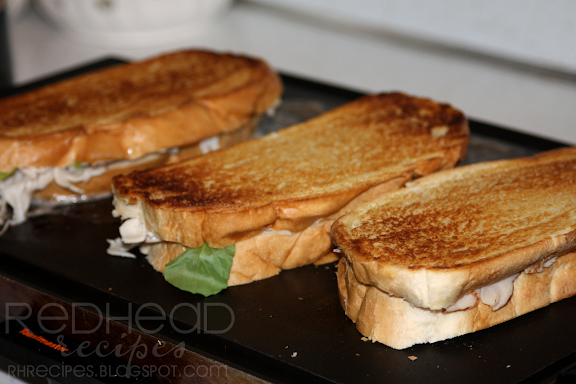 Put your slices together and place onto hot panini press. Press sandwhiches until warmed through, cheese has melted, and the bread is crisp. No Panini Press? 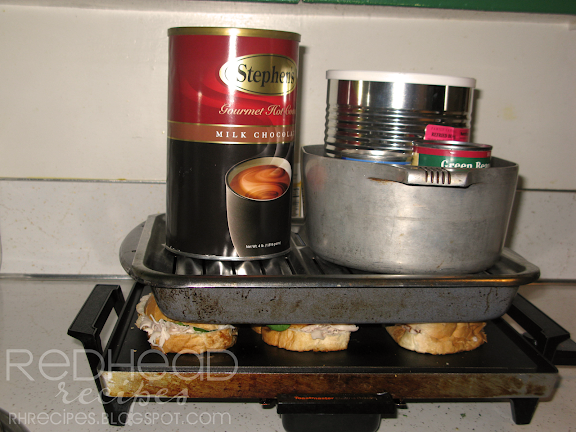 Not a problem - check out how to make a panini press from what you already have in your kitchen! You can prepare these ahead (up to a few hours), wrap them up, and cook them when ready. Buy the sun-dried tomatoes in oil, the dry ones are not the best texture. Have your local bakery slice your bread loaf for you to cut on time. My husband summed it up well when he tried my leftovers, "Oh, it isn't another Cafe Rio." 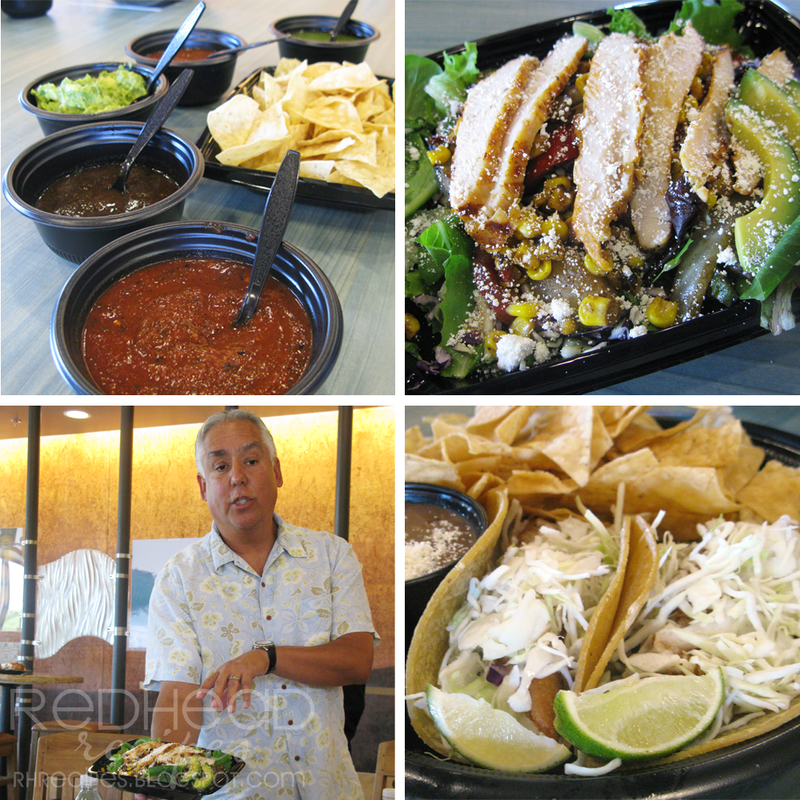 Last week Rubio's invited a few of us bloggers to try their delicious food. We were stuffed of delicious burritos, tacos, salads, and their variety of salsas. I knew about Rubio's long ago becuase my mom said they are her favorite fish tacos ever. (and she lives in Hawaii! She has had good fish.) But they have such a variety of flavors and dishes. My favorite dish was their roasted vegetable salad. With all this chicken, avocados, and a delicious dressing for 320 calories. I keep tellingi everyone that because I can't believe it. But it had so much flavor you didn't feel like you were eating 2000 calories less than some other fresh mex salads in town. They have other great options for the health conscious eater - grilled fish or chicken tacos, whole wheat tortillas, 4 different salads. They are great to substitue anything for anything if you want. I love that. Everything I tasted was delicious, fresh, and full of flavor. They were nice enough to donate a free meal to one lucky winner. Sorry, this giveaway is now closed to see the winner, click here. To win, leave a comment on this post by midnight, Monday, July 26th to enter. If you don't have an address linked to your profile, please leave it in the comment. About 3 1/2 years ago my sister started a cooking club with a bunch of her friends and invited me. I was newly married and really didn't have too many married friends. Every month we would get together with a theme (an ingredient, an idea, a dish) and everyone would bring a dish. It was so fun. Saturday was my last cooking club ever. I choose the theme - using an ingredient you have never used before. I have eaten plenty of prosciutto in my day, but never actually cooked with it. And I have never used mascarpone cheese. I saw this recipe on Food Blogga. It is so delicious. I think everyone needs to try it. What I will give you is the process, but if you want the full recipe check out Susan's recipe over at Food Blogga. Brush slices of crusty bread with olive oil, grill until golden brown, flip, repeat. Set aside. 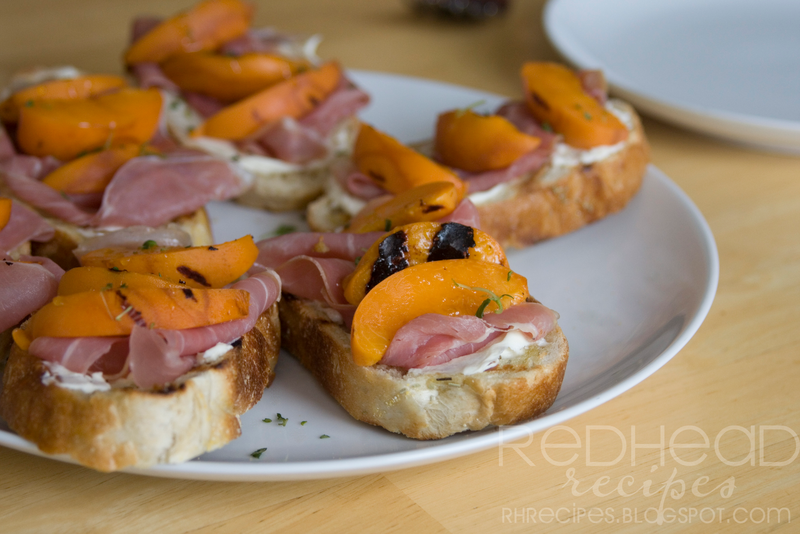 Cut apricots in half, brush with olive oil and place cut side down on the grill. Cook until grill marks appear, about 3 minutes. Flip and cook for a minute or two, just to help the fruit warm all the way through. When done, cut each half into four wedges. Assembly: On each piece of toast spread a layer of mascarpone, then place a slice of prosciutto, (I put mine on the grill pan for a few seconds to bring it to room temperature.) drizzle with honey, and top with a little rosemary (or thyme in my case). These are great warm or room temperature. 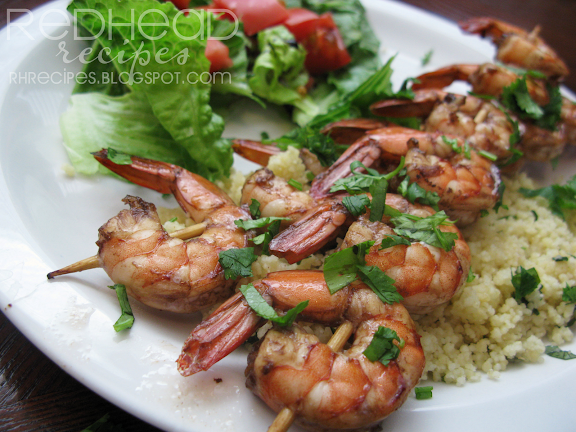 Tip: Use a grill pan, these are fast, and then you don't have to heat up your grill. Thank Susan for the recipe - what a great balance of flavors and textures! So the other day the girls were up at our cabin. We had planned fabulous, delicious food. One of said meals was a panini and soup. The only problem is our cabin doesn't have a panini press (and on that note, neither do I). So we got creative. Place said paninis on griddle. Find something flat (baking dish, roasting pan, skillet) and place on top. Then place on the flat item place something heavy - in my case, the heaviest cans we could find. When bottom side of your panini is flat and golden, flip and repeat! We made my friend Alma's recipe - Brie, watercress, turkey (good stuff - no fake lunch meat stuff, this is fancy! ), and green apples. It doesn't get much better than that! If you didn't know, I am a foodie by day and a nurse by night. I work night shifts in Labor and Delivery (although I just worked my last shift before the move) which are 6 pm to 6 am. It is no surprise that I am pretty tired the next day because I am up at 8:30 with Lou. So yesterday, I was a little to tired to make anything elaborate. I had my husband pick up a rotisserie chicken and we had bread and these Roasted Brussels Sprouts with it. I have to say, it was way to easy to taste that good. But here's the simple recipe for these delicious greens. Cut the ends of the Brussels sprouts off. Peel away any yellow or brown leaves. Cut in half. Place in baking dish or cookie sheet and toss with olive oil. Season with salt and pepper. Place in 400 degree oven for 15 to 20 minutes. Top with grated Parmesan cheese or a light drizzle of balsamic vinegar (or both!). 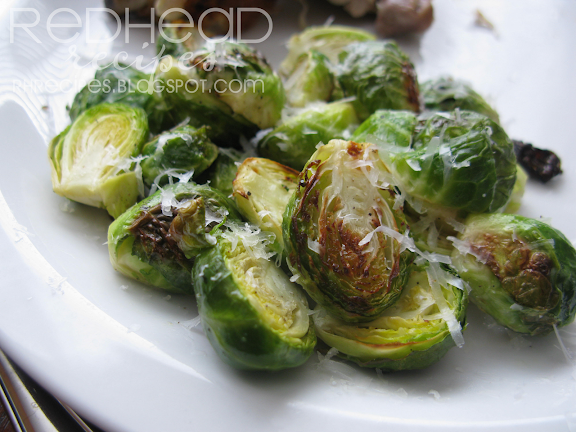 Purchase sprouts that are bright green and have tight outer leaves. Avoid sprouts with soft or black spots. I was inspired by Miranda to do this 12 on 12 project. I have wanted to do it in the past, I just didn't take the time to do it. July was my month - I was going to do it. Unfortunately, my 12th was pretty mundane. But it's fun to see what people's "everyday"s are like. 1. Prepare to get some cleaning done: give her two graham crackers and maybe I will have enough time to do some dishes. 2. Nope. She wanted to help unload the dishwasher. 3. Didn't get much done during Lou's awake time, but during her nap I was quite productive. I made some cards using some new stamps I got with my sister. 5. My simple lunch - "baked" (nuked) potato with fat-free sour cream and steamed broccoli. 6. Lou woke up, time for some errands. I have a secret love for office supply stores. 7. Deliver said cards and others to the post office - don't you love getting real mail? By the way, that's my husband's hairy arm. 8. Lou was so great to run so many errands with me. Yes, she is a finger sucker. 9. Meet Mr. Recipes. We picked him up from work. He always makes us laugh. 12. Apple Crisp and a movie to finish up the day. My post for today won't be up until this evening because I am working on the 12 on 12 ... but I've only got about 6 so far. For the fourth of July, we got together with my sister's family and had some delicious food. We made salsa and burgers and had corn on the cob and watermelon. It was the perfect summer meal. I bought popsicles for dessert, but my brother-in-law doesn't believe something is dessert unless it has chocolate, so they bought a delicious Boston Cream Pie. 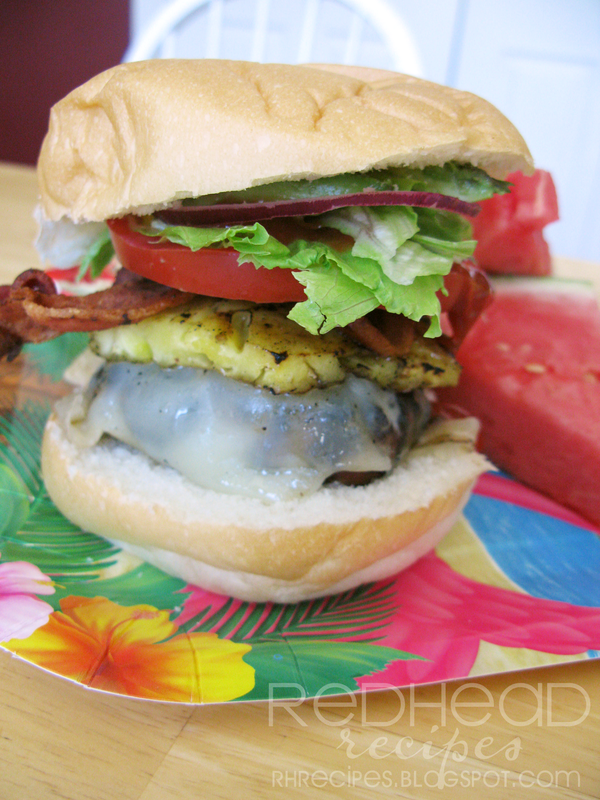 I made the burgers and brought lots of delicious toppings: bacon, provolone (no plastic "cheddar" allowed in this family), grilled pineapple, red onions, tomatoes, lettuce, and avocado. Of course I couldn't decide which to include, so I did them all! Looks yum doesn't it? Although, it was hard to eat by the end -- I had to use a fork and knife. PS - this is how we like burgers in our family (at least the girls): a little meat with lots of toppings! Don't use a low-fat burger meat - you need the fat to hold it together. Add some flavor, just throw in some sauces, spices that you like. But I always recommend Worcestershire. For these burgers I put tomato paste, BBQ seasoning, mustard, and Worcestershire. What do you like in/on your burger? Check out the current issue of Utah Valley Magazine. I was so honored when they asked me to create a breakfast recipe for them. 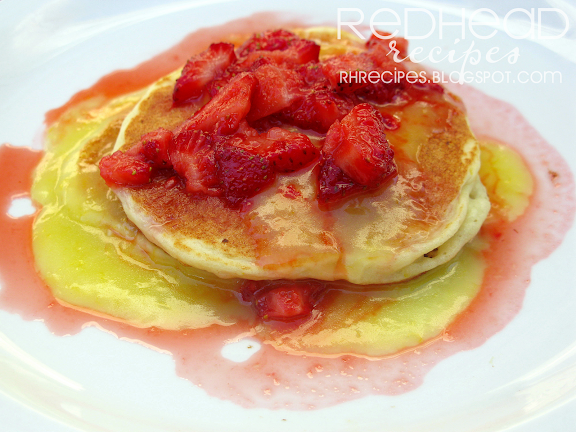 Had I known it was a before-school breakfast feature I might have done something a little quicker for those busy moms but -- this recipe can all be made in advance and you can just grill the pancakes before the kiddos go off to school. Check out UV Magazine on pg 50 to see this recipe. I love Independence Day! Probably because I love the food that is associated with it. (Big surprise right?) I love all the fresh fruits and veggies but I also love barbecues and frozen desserts. The best part is - the whole family gets the holiday off and we get to spend it together. This year is fun becuase it's not just one day - we are celebrating Saturday, Sunday, and Monday! With all this celebrating, we will be having lots of meals - I'm sure you will be too. If you need some ideas here are some festive ideas or summer favorites. Blueberry Pancakes with Strawberry topping - red, white and blue! Steel Cut Oats - with strawberries and blueberries - again... red, white and blue! Baked Beans - no barbecue is complete without them. These are great, make ahead in your crockpot! Burgers of all kinds, but try this Teriyaki Burger. If you are looking for other types of burgers - check out Rachel Ray's collection - she's the queen of burgers. Apple Crisp - nothing says America like apple pie or crisp! Grill pizza - place this pizza dough on the grill, then add your toppings, close the grill until dough is cooked and cheese is melted. This cake (pictured above) is amazing! 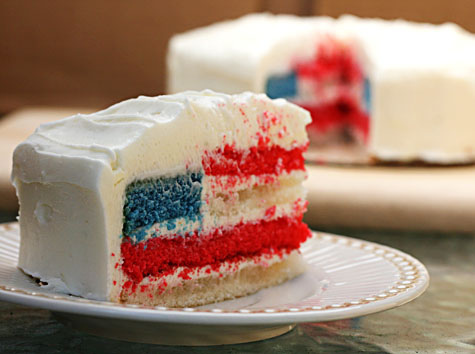 Such a fun twist on the typical american flag cake! It can't seriously be July already can it? It's hard to believe. July is a big month for us - lots of holiday celebrating, birthdays, finals, and moving! 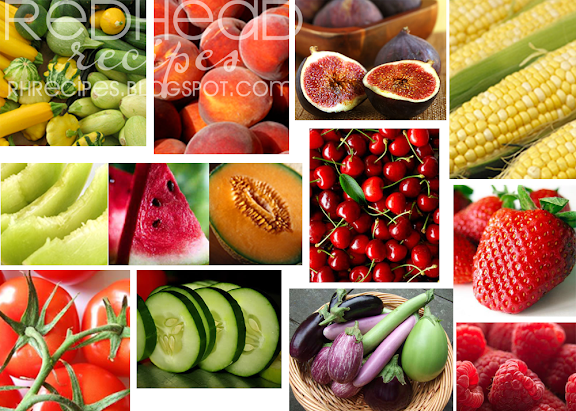 You can bet that to some of the parties I will be taking things using this great produce. I love the summer for the produce. (If it wasn't so hot it would be my favorite season. What else is in season in July? I try and do this monthly so you can see what's in season each month.